I’ve taken many trips to wine-making regions far away—including California, France, Italy, Spain, Greece—but lately I have been spending more time closer to home, tasting my way through the Northeastern US. If you live in the Northeast, many of the outstanding northeastern wine regions can be discovered without even getting on a plane. Just a few hours’ drive will take you to the heart of any one of these areas, perfect for spending a weekend at a charming bed and breakfast inn. Visiting a beautiful vineyard to see firsthand how the wines are crafted is an unforgettable experience, and a purchase from a winery you’ve visited makes that bottle extra special and more memorable. 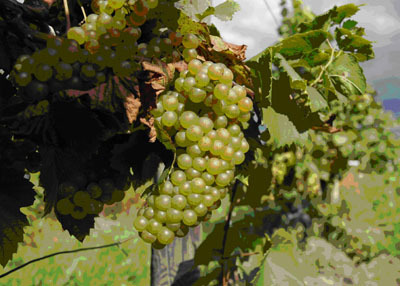 The cooler climate conditions in the Northeast make French-American hybrid grape varieties like Seyval, Vidal Blanc, and Marechal Foch very popular choices with growers. Many wine producers have exclusively focused on varieties like Chardonnay, Gewürztraminer, Pinot Gris, and Pinot Noir. Other grapes that grow well in these regions are Riesling, Merlot, Gamay Noir, Cabernet Franc, and even some excellent Cabernet Sauvignon. All of these varieties produce wines that pair excellently with food. Given the growing conditions and varieties, it is not surprising to find superb “traditional method” sparkling wines and sweet late harvest wines. The Long Island wine region, the youngest in New York State, has a unique terroir featuring an abundance of outstanding crops, especially for grapes. There are over 50 wineries, with vineyards located on the North and South Forks at the East End of Long Island. If you visit, consider staying overnight at a winery: Shinn Estate Vineyards offers the Farmhouse, the only bed and breakfast on an East End winery property. Other wineries to include on your North Fork tour are Castello di Borghese Vineyard & Winery (the oldest on Long Island), Diliberto Winery, Macari Vineyards, Palmer Vineyards, Peconic Bay, Pindar, Bedell Cellars, Pugliese Vineyard, Lieb Family Cellars, Pellegrini Vineyards, and Waters Crest Winery. On the South Fork there are Wölffer Estate, Duckwalk Vineyards and Channing Daughters. All produce award-winning wines. Slightly over an hour’s drive from New York City is the Hudson River Valley, an incredibly historic area. The oldest vineyards in the country were planted here in the 1600s, and the first winery was built here. Today there are more than two dozen wineries. Be sure to visit Brotherhood Winery, the oldest winery in America. Other suggestions: Clinton Vineyards, Millbrook Vineyards & Winery, Oak Summit Vineyard, and Stoutridge Vineyard. 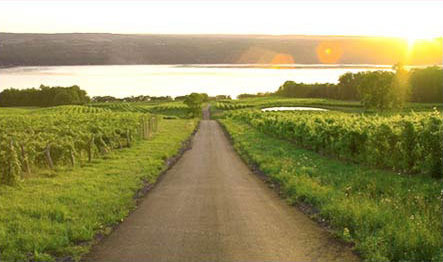 Worth the drive, the breathtaking Finger Lakes wine region is centered around four main lakes that were carved out by glaciers. You’ll find more than 100 wineries in this area. Don’t miss Dr. Konstantin Frank Vinifera Wine Cellars, home of one of the best Rieslings in the world, and winner of numerous gold medals. Other wineries of note: Hermann J. Wiemer Vineyards, Casa Larga Vineyards, Fox Run Vineyards, Goose Watch Winery, Heron Hill Winery, and Rooster Hill Vineyards. Connecticut is fast becoming a wine-growing region, with 20 wineries. Vineyards close to the coast on the Long Island Sound and Connecticut River enjoy a warm climate and produce some great varietals, but there are also terrific wines produced in the cooler areas of the eastern and western highlands. Visit Chamard Vineyards—nominated best winery in the region—for classic Chardonnay. Other stops: Holmberg Orchards (which specializes in fruit wines), Miranda Vineyard, and Saltwater Farm Vineyard. New Jersey wine growers are becoming increasingly known for their Cabernet Sauvignon, Cabernet Franc and Merlot. With 33 wineries scattered throughout the state, the most notable are Unionville Vineyards, Silver Decoy Winery, Westfall Winery, and Four Sisters Winery. The small state of Rhode Island has five wineries. Most are found close to the coast, where the growing season is longer and intermittent fog and ocean effects aid in producing outstanding wines. Check out Sakonnet Vineyards, with its large selection of wines, including dessert wine and port. Newport Vineyards and Winery is also worth a visit. In Massachusetts many of the more than two dozen wineries are located in the southeastern section of the state, including Cape Cod and the Islands, while others are scattered west of Boston. Fruit wines are common; grape wines are often made from fruit imported from other parts of the country. 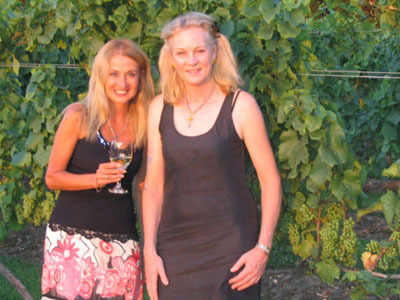 Westport Rivers Vineyard and Winery grows its own grapes and produces a highly acclaimed sparkling wine. 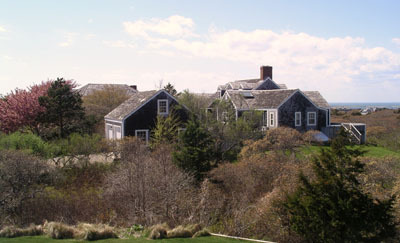 Other suggestions: Nantucket Vineyard, Truro Vineyards. New Hampshire has beautiful countryside that boasts over a dozen vineyards, as well as orchards and rustic farms that produce delicious fruit wines. Zorvino Vineyards makes both grape and fruit wines—their Peachez wine is the perfect summer drink, especially when paired with grilled shrimp. Other stops: Flag Hill Winery, Jewell Towne Vineyards, and Piscassic Pond Winery that specializes in mead (honey wine). To help you plan your winery visits, I’ve listed a few recommended wineries in each region—but there are many others worth visiting, as long as you’re in the neighborhood! A fun part of planning your wine adventure is mapping out your itinerary. Be sure to contact wineries in advance to check when they’re open for tours, and what wines are available for sale.